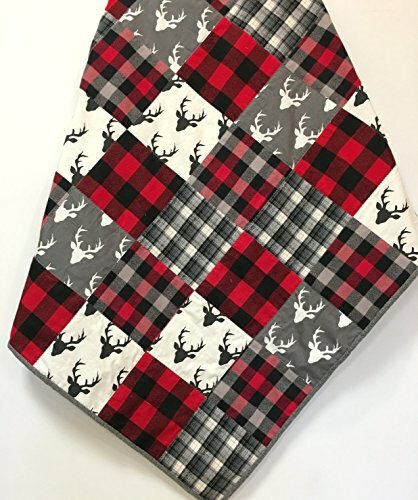 I created this Buffalo Plaid Patchwork Baby Quilt with 3 high quality cotton woven plaid flannels and two cotton deer head prints in colors of Red, Black and Gray. Popular for the Woodland Rustic Nursery. The backing is a gray shetland flannel. This Quilt is warm and comfy to snuggle with. It measures 38" by 46" this is a nice crib size. It has warm and natural batting between the layers and I machine quilted in a zig zag stitch between the patchwork. The zig zag stitch adds to the rustic of the quilt. I finished the edges with a traditional hand stitched binding. After completion I machine washed the quilt on gentle cycle using a gentle laundry detergent and tumbled dried on low heat...Pictures do not capture the true beauty of my Quilts. When you see one of my Quilts in person and hold it in your hands; you will know you have a Treasure. Handmade in Wisconsin USA. All my Items are made by me from start to finish. If you have any questions about this product by Carlene Westberg Designs, contact us by completing and submitting the form below. If you are looking for a specif part number, please include it with your message.